The first galaxies were formed within the first billion years of the Universe’s history. Our Milky Way galaxy contains very old stars with ages indicating formation around 500 or 600 million years after the Big Bang. Astronomers are very eager to study galaxies in the early universe, in order to understand galaxy formation and evolution. They can do this by looking at the most distant galaxies. With the expanding universe of the Big Bang, the farther away a galaxy is, the farther back in time we are looking. Astronomers often use redshift to measure the distance, and hence age, of a galaxy. The larger the redshift, z, the farther back in time, and the closer to a galaxy’s birth and the universe’s birth. The interstellar medium of a galaxy consists of gas and dust. The gas can be hot or cold, and in atomic or molecular form. Atomic gas may be ionized by ultraviolet starlight, or X-radiation from neutron stars or black holes (not the black holes themselves, but hot matter near the black hole), from cosmic rays or from other astrophysical mechanisms. Our Milky Way galaxy is rich in gas and dust, and contains thousands of molecular clouds. These are very cold clouds composed mainly of molecular hydrogen but also many other molecular species. Molecular clouds are the primary sites of new star formation. 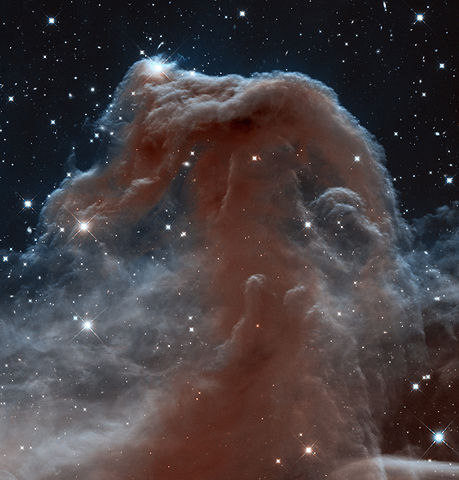 The Horsehead Nebula is an example of a molecular cloud in the constellation of Orion. During their most active phase of star formation, a large galaxy might give birth to over 1000 solar masses worth of stars per year. By comparison, in the Milky Way galaxy, the new star formation rate is only of order 1 solar mass per year, the equivalent of 1 Sun, or, say, 2 stars with half the mass of our Sun, per annum. Over its entire 13 billion year life the Milky Way has formed many hundreds of billions of stars, so clearly the star formation rate was higher in the past. Before the first stars and galaxies form, the universe contains only hydrogen and helium, and no heavier elements. Those are produced by thermonuclear reactions in stellar interiors. This is a wonderful thing, because carbon, oxygen and other heavy elements are essential to life. After a galaxy produces its first generation of massive stars, its interstellar medium will begin to contain carbon, nitrogen, oxygen and other heavy elements (heavy means anything above helium, in this context). Massive stars (above a few solar masses) evolve rapidly, with timescales in the millions of years, rather than billions, and explode as supernovae at the end of their lives. A large portion of their material, now containing heavy elements as well as hydrogen and helium, is expelled at high velocity and mixed into the interstellar medium. The carbon, nitrogen and oxygen which is then in the respective galaxy’s interstellar medium can be detected in atomic (including ionized) or molecular forms. The relative abundance of heavy elements grows with time as more stars are formed, evolve, and recycle matter into the interstellar medium. 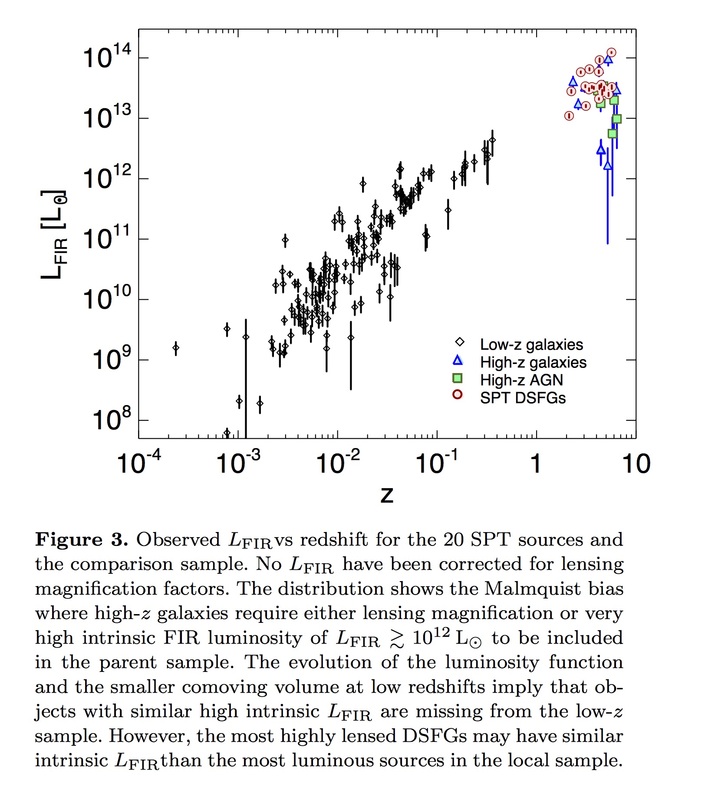 High-redshift (z > 2) galaxies with active star formation are best observed in the infrared. The gas and dust in molecular clouds is quite cold, usually less than 100 K (100 degrees above absolute zero). And their radiation is shifted further toward the far infrared and sub-millimeter portions of the spectrum by the redshift factor of 1+z. So radiation emitted at 100 microns is detected at the Earth at 400 microns for a source at z = 3. These are difficult measurements to make, because if the galaxy is very distant, it is also very faint. However the possibility of getting good measurements is helped by two things. One is that galaxies with very active star formation are intrinsically brighter. And the other reason is that intervening clusters of galaxies are massive and contain mostly dark matter. As we look far back through the universe toward an early galaxy, there is a good chance that the line of sight passes through a cluster of galaxies. Clusters of galaxies contain hundreds or even thousands of galaxies, and are dominated by dark matter. Most of the infrared radiation can pass through the intracluster medium – the space between galaxies – without being absorbed; it does not interact with dark matter. The clusters are sufficiently massive to bend the light, however, according to general relativity. As the background galaxy’s light passes through the cluster during its multi-billion year journey to the Earth and our telescopes, the cluster’s gravitational potential modifies the light ray’s path. Actually the intervening cluster of galaxies does more than displace the light, it acts as a lens, causing the image to brighten by as much as 10 times or more. This makes it much easier to gather enough photons from the target galaxy to obtain good quality results. An international research team with participants from Germany, the U.S., Chile, the U.K. and Canada has identified 20 high redshift “dusty star forming galaxies” at very high redshift (DSFG is a technical term for galaxies with high star formation rates and lots of dust) from the South Pole Telescope infrared galaxy survey. They have been able to further elucidate the nature of 17 of these early galaxies by measuring C II emission from singly ionized atomic carbon, and CO emission from carbon monoxide molecules for 11 of those. They have also determined the total far infrared luminosity for these target galaxies. Their results allow them to place constraints on the nature of the interstellar medium and the properties of molecular clouds. The galaxies’ high redshifts, ranging from z = 2.1 to 5.7, actually makes it possible to make Earth-bound measurements in most cases. At lower redshifts the observations would not be possible from Earth because the Earth’s atmosphere is highly opaque at the observation frequencies. But it is much more transparent at longer wavelengths, so as the redshift exceeds z = 3, Earth-based observations are possible from favorable locations, in this case the Chilean desert. For three sources with redshifts around 2 the atmosphere prohibits ground-based observations and the team therefore made observations from the orbiting Herschel Space Telescope, designed for infrared work. The figure labelled Figure 3 below is taken from their paper. It indicates the redshift z on the x-axis (logarithmically) and the far infrared luminosity of the galaxy on the y-axis (as the log) as well. The 17 galaxies studied by the authors are indicated with red dots and labelled “SPT DSFGs”. Their very high luminosities are in the range of 10 to 100 trillion times the Sun’s luminosity. Note that the luminosities must be very high for detection at such a high redshift (distance from Earth). Also these luminosities are uncorrected for the lensing magnification, so the true luminosities are around an order of magnitude lower. The redshift range covered in this research corresponds to ages for the universe of around 1 billion years old (z = 5.7) to a little over 3 billion years old (z = 2.1). So the lookback time is roughly 11 to 13 billion years. For those of us interested in dark matter, their findings regarding the degree of magnification by dark matter are also interesting. They find “strong lensing” or magnification in the range of 5 to 21 times for 4 sources that allowed for lens modeling. The other sources do not have magnifications measured, but they are presumed to be of the same order of magnitude of around 10 times or so, to within a factor of 2 either way. It is only because the lensing is so substantial that they are able to measure these galaxies with sufficient fidelity to arrive at their results. So not only is dark matter key to galaxy formation and evolution, it is key to allowing us to study galaxies in the early universe. Dark matter forms galaxies and then helps us understand how they form! This entry was posted on Saturday, June 6th, 2015 at 2:12 am	and tagged with clusters of galaxies, Dark matter, DSFG, dusty star-forming galaxies, galaxy formation, gravitational lensing, Horsehead nebula, molecular clouds, star formation and posted in Dark Matter. You can follow any responses to this entry through the RSS 2.0 feed.